Last month I went to New York City. New York is a big city on the east coast of the United States, in New York State, and you might have heard of it if you have seen any films such as ‘Home Alone 2: Lost in New York’, or watched TV such as ‘Cash Cab’. I’d heard of it because I had been there before a couple of times, several years ago now but I still remembered the famous sights like the Imperial State Building and Centre Parks. Now before you say “geddouddahere”, calm down New Yorkers, I am joking. I love New York. It is pretty bloody awesome – but when I went last month, it was also pretty bloody cold. Record coldest Valentines Day in fact! So the sketching was at a minimum, but I still did some. Why was I here? It was a surprise trip in fact, my wife had arranged it in secret for my 40th birthday, and had told me on my birthday a few days before. Not only that, but I was to fly out there by myself and meet up with two of my best and oldest friends from London, Simon and Roshan, for a Boys’ Weekend. Quite the surprise! We stayed in an apartment on Bleecker Street, Greenwich Village, a couple of blocks from Washington Square. In fact if we lived in the Marvel Universe, this was right across the street from Dr. Strange’s Sanctum Sanctorum. If you don’t know what that is, fine, there’s a movie coming out in November. I flew overnight (having sung Yellow Submarine on karaoke to the music of Modern Love just hours before) and arrived on a frozen morning. We walked up Fifth Avenue for a bit just going “Wow New York dudes!” before stopping into a little place called Grimaldi’s for pizza. 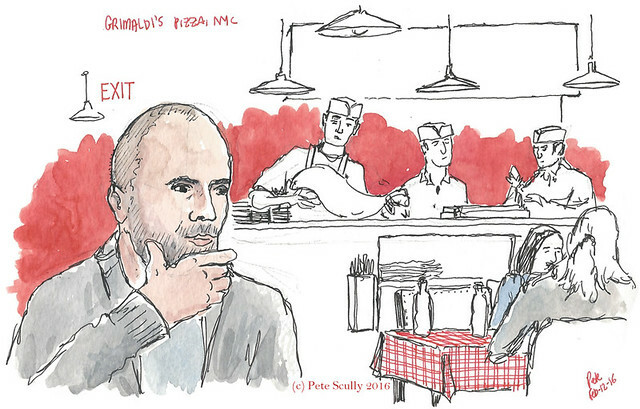 I did a sketch of Simon inside, waiting for his pizza (or “pie” as they like to say out here). It was very nice pizza. 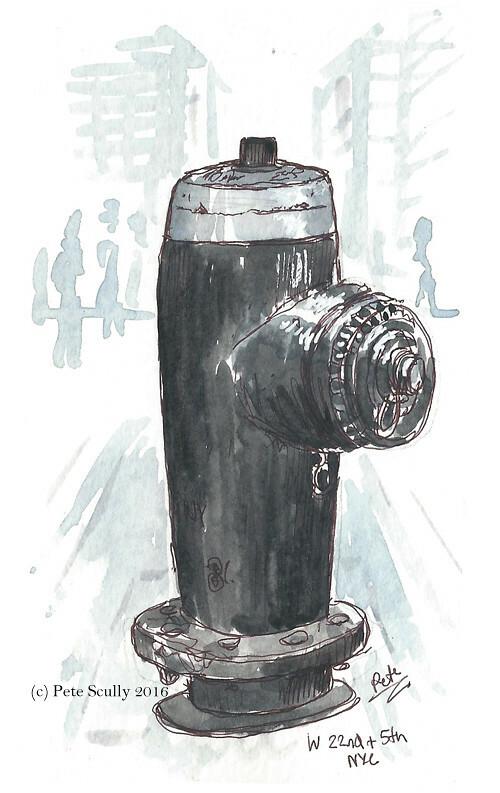 There were a lot of fire hydrants in New York. I would like to go back and sketch more of them. I did this one however while Simon was inside a shop trying on trousers (or “pants”). Oh boy, it was cold. Not as cold as it would get in the coming days, in fact I’d look back on this cold as some sort of Golden Age, but too cold to sketch much else. We walked up to the Flatiron, before knocking the walking on the head and went to Pete’s Tavern. Bar sketches will be posted later. 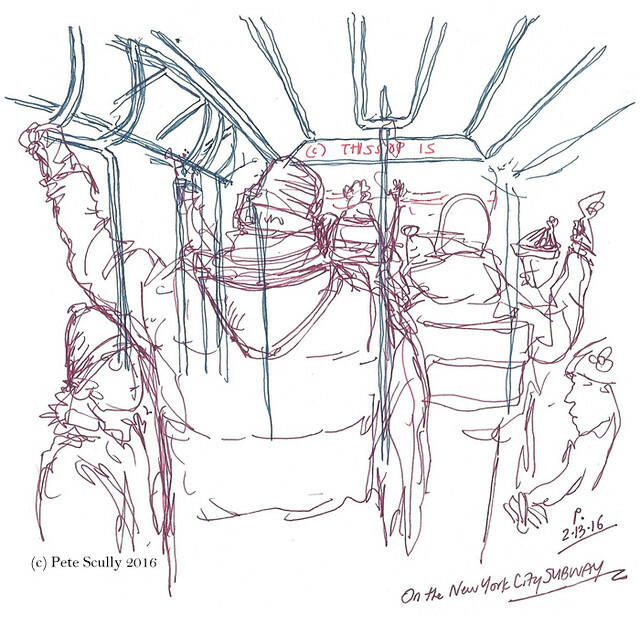 For now, here is a sketch from the Subway, from a different day. And a photo of the Flatiron Building. What a lovely surprise. Funnily enough, when I met up with two friends from back home in Scotland in NYC last year, it was also bloody cold. I could barely take photos because my fingers were so numb. I, therefore, commend you for still being capable of holding a pen and sketching. We on America’s east coast are very much looking forward to Spring. I have had it with the cold. I was glad to see another fire hydrant in this post. I always love those studies of yours. It was so ridiculously cold. I got back to Davis and they had had weather in the low 80s while I’d been gone. I didn’t mind the unbearable cold as much as I thought I would though, I’d wrapped up super warm and layered, I got to eat some nice soup, and it made going back inside so much nicer. The last picture of the funny building ` We have one in Toronto near Front street. It’s really unusual isn’t it. nice.. i would lov to go to new york city!